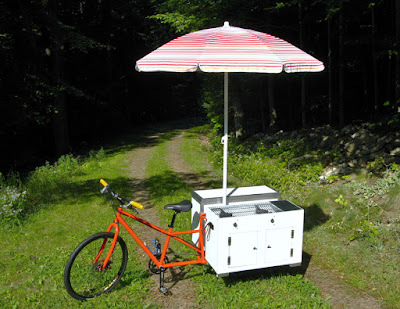 Hannah had worked with Frank the Welder (Frank Wadelton, an MTB builder in Bellows Falls www.frankthewelder.com) to design and build a frame that could hold two large vendor boxes (one for hot food prep and one for cold storage) on the back. Then she had started building one of the vendor boxes with metal sculptor Mark Goodenough (www.markgoodenough.com). But the design had gotten stuck and when I talked with her several months later the bike still needed more work done. I offered to help finish the bike, and she dropped the pieces off at my barn. The first thing that I did was to prop the box up on the frame and stare at it for a month, while we talked about what needed to fit on and in the box, and how it would be connected. Once we had an idea of what was necessary, we started finishing up the boxes. The first box needed to be double walled, as it was for cold storage and needed a layer of insulation. 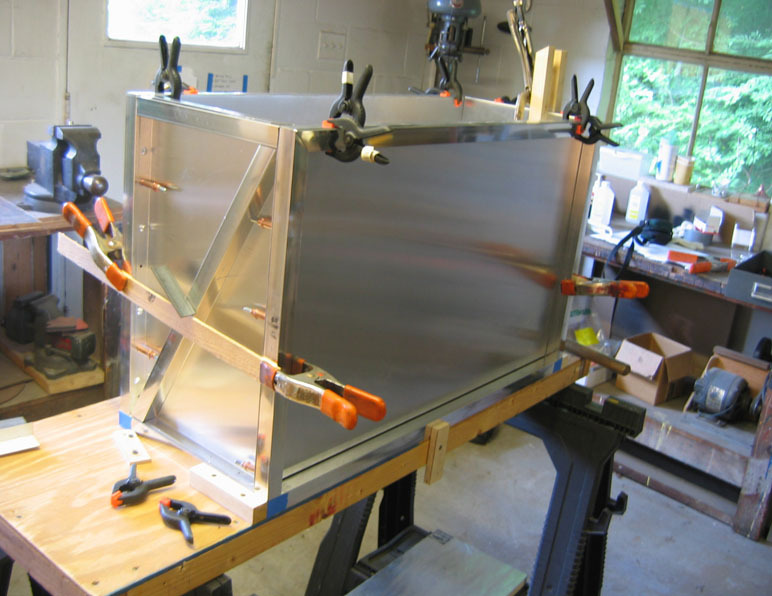 Mark had built the box using thin wall aluminum square tubing to reinforce the corners, and then he stuffed rigid insulation in the sides before putting on the outside sheet metal skin. The second box was for cooking, and needed only single wall construction, so we decided to bend it out of one large piece of sheet metal. I was only too happy to do this, as all my life I've been bending sheet metal with either hand tongs or clamped onto a couple pieces of angle iron, and this gave me a perfect excuse to finally go buy a small 36" sheet metal brake. It turned out that Hannah loved working on the brake too, often taking a piece of sheetmetal to it and returning later with a door or other piece bent very nicely. 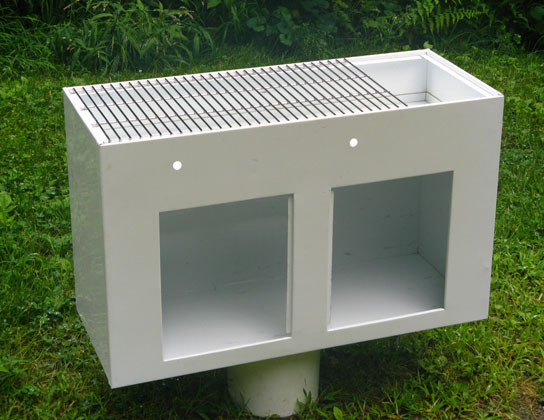 The hot box carcase is single wall prepainted aluminum, with a face glued and riveted onto a sides, bottom, and back assembly that was bent from one piece of sheetmetal to minimize the number of joints. 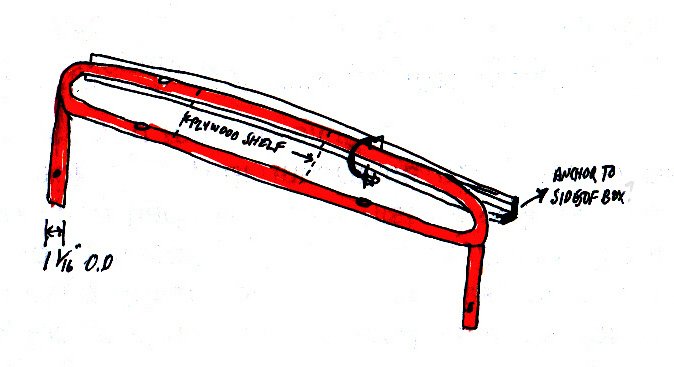 There are two burners that fit into the top compartment, and a small propane cylinder in the bottom. 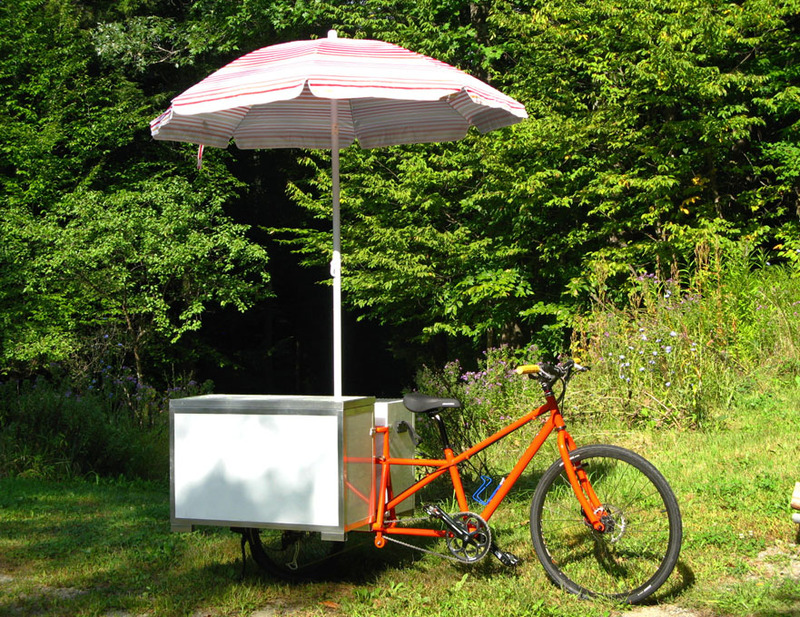 Hannah had designed the bike frame to be modular, so that she could easily put different size and shape boxes on it depending on vending needs. 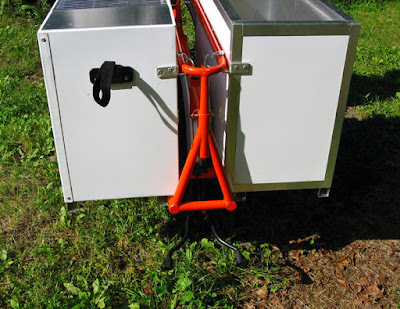 We figured out a simple hoop adapter that would connect the sockets on the bike frame to aluminum angle ell attached to the back of the boxes. The center part of the hoop was also covered with wood to form a small counter for holding condiments between the boxes. To hold the hoop up, a tube had to run from the frame sockets which are for 1 1/8" tubing to the hoop which is 3/4" tubing. Instead of squishing the end of a larger piece of tubing down to the diameter of the hoop, I used the tapered ends from a front fork. First I bent an old fork straight. Next cut it to a length that fit well inside the sockets. 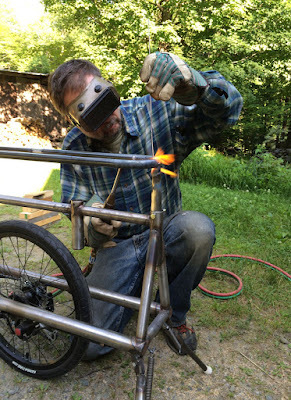 I've been using a MIG welder on the bikes, but since we already had the gas torch out for bending the curves on the end of the hoop, I used the torch. Once the boxes were firmly attached to the bike, we each took first rides to check on the balance and ease of riding the bike. 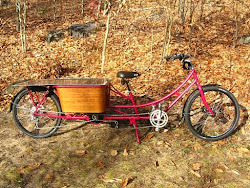 It rode surprisingly well, although we knew it might be harder to ride when the boxes were full of food. (It would be possible to fit a bottom bracket electric motor like a BBS02 if necessary.) With the frame work done, we took the bike apart down to the bare frame and sent it out to be powder coated. Here is a closeup of the box attachment, with feet that locate the bottom edges on the support rails, and upper aluminum ells on the boxes that slide under the hoop and are held in place with pins. 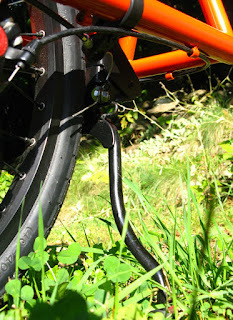 You can also see the new kickstand. We decided that the original version was too hard to use, because it required walking around to the back while balancing the bike. After removing it I added a U channel to the frame that would fit a standard bike stand, so that we could easily add and modify a ready made stand. 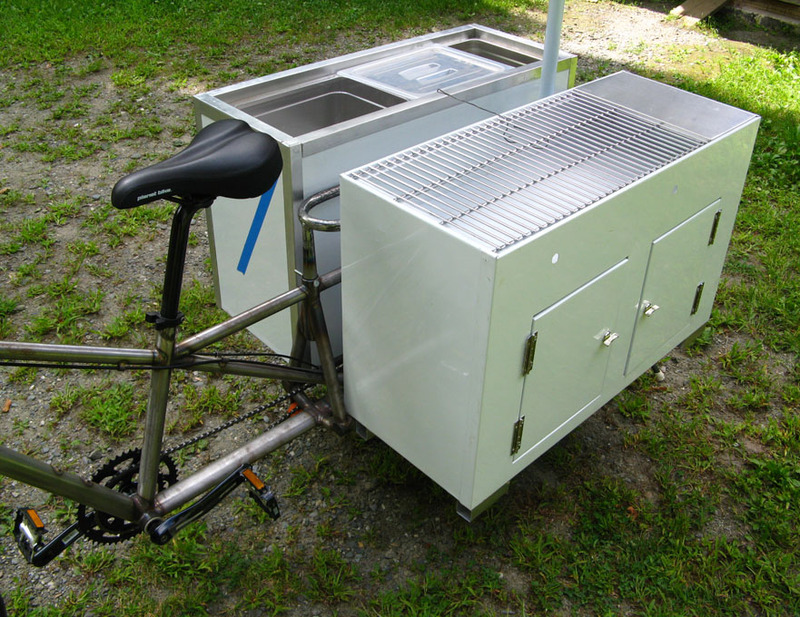 This stand's feet are only 8" wide, and after testing the bike assembled, we found that with only one box mounted on the bike (i.e. unbalanced while loading) a width of 14" was necessary to hold the bike up, and it would be even wider with an unbalanced load of food. The kickstand does give the bike a nice dual exhaust pipe look though. 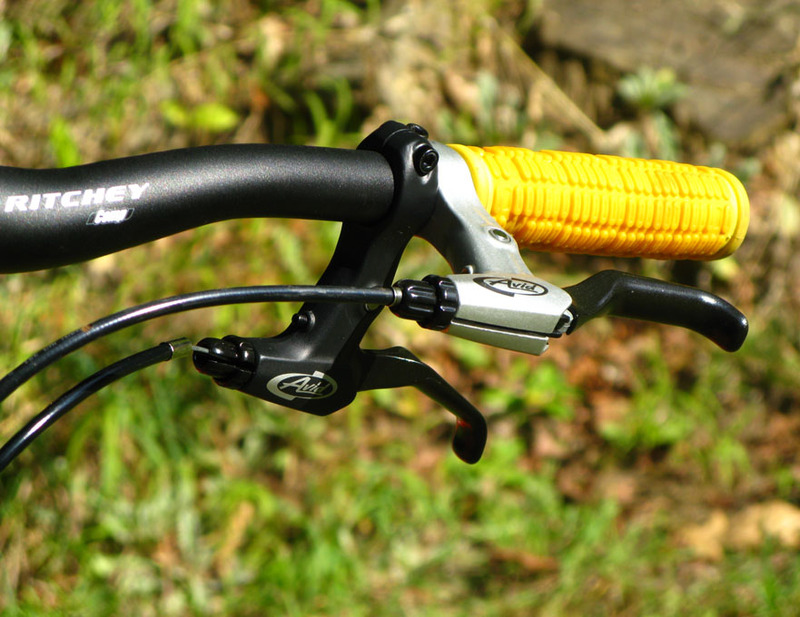 We used a second brake lever (the black one) with a cable running back to the kickstand to pull it down when parking. In addition to Hannah's choice of Pumpkin orange paint, you'll note her corn style handgrips. Sorry for the shaded parts of this photo, you can just see the cable from the brake lever coming in at the upper left and ending in a brake adjuster nut fit into a black nylon frame tube clamp. Then the center wire runs back to a loop I welded onto the kickstand. It took a lot of fussing to get the length of the pull to match the hand lever travel, but with care spent adjusting the angle of pull, the force to pull the stand down turned out easier than expected. Besides the stand being too narrow, I also don't like this one because the riveted pivots needed to be aligned to work smoothly, and it snapped shut and gave me a wicked blood blister. We'll use a different stand next time. Left side view of the almost completed bike, while testing for fit and last minute changes. The lid on the cold box opens to form the serving counter. At the beginning of October 2015 the Bellows Falls Community Bike Project (bfbike.org) held a fund raiser with cookies and cakes. 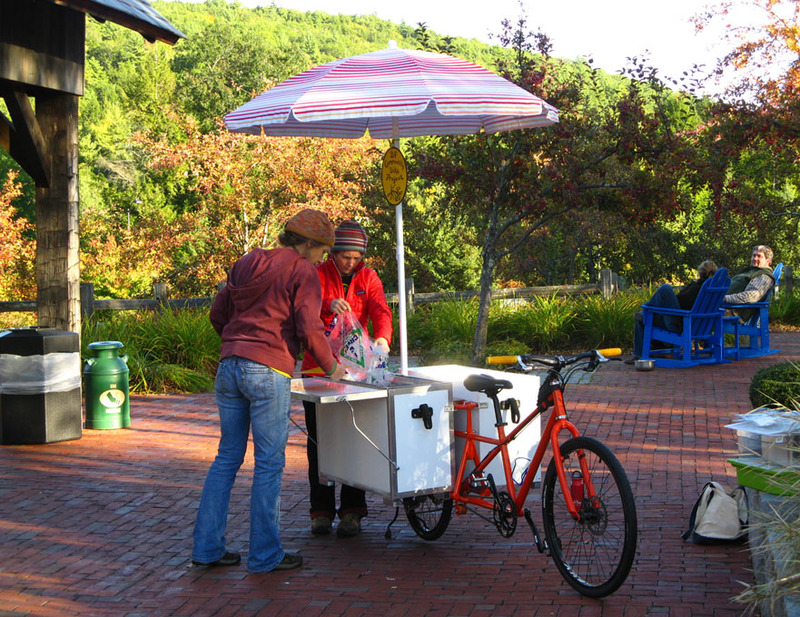 The Welcome Center on Interstate 91 has a small pavilion that non profit groups are allowed to use, and Hannah brought her bike to help catch the attention of travelers as they walked by into the Center. 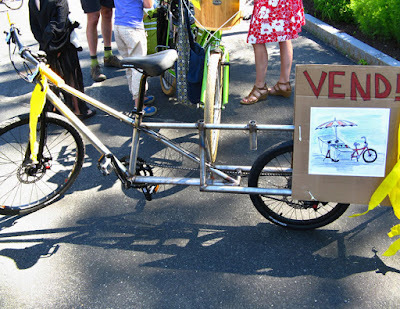 In the future she is thinking of using the bike at local farmers markets or other similar events, and learning how well it works and what might be improved. 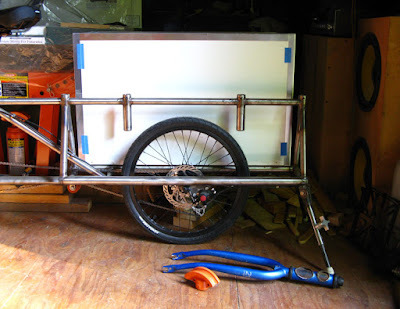 It might turn out to be nice to have a motor, and we already know the kickstand could be wider. (Hannah is thinking that drop down legs at the corners of the boxes might be the best solution for a stand because they would work on uneven ground, but a season of use will give her a better evaluation.) This was a fun project, thanks Hannah! 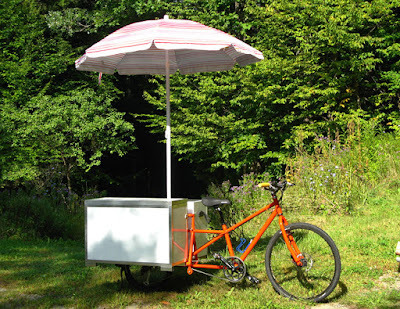 Riding a bike is a rite of passage, a passport to worlds beyond the front lawn. Bikes represent fun, freedom, and fresh air -- everything that's good about being a kid. 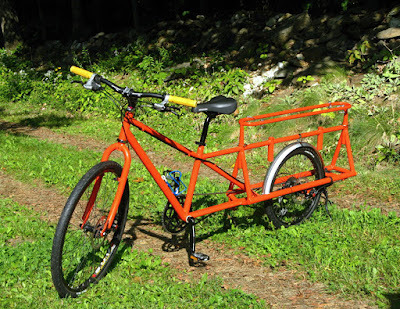 Moreover, biking is a healthy pastime that kids will never outgrow.See this blog. That's A excellent post. I am very much happy to be in your blog. I should praise your talent. Thanks for sharing. Electric bicycle battery are the most challenging component for E-Bike because of cost and quality. Great insights and thanks for doing what you do. 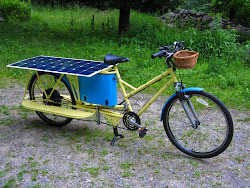 Would love to discuss solar charging more and see if you would be willing to do a guest post for us at https://www.ebikekit.com/. 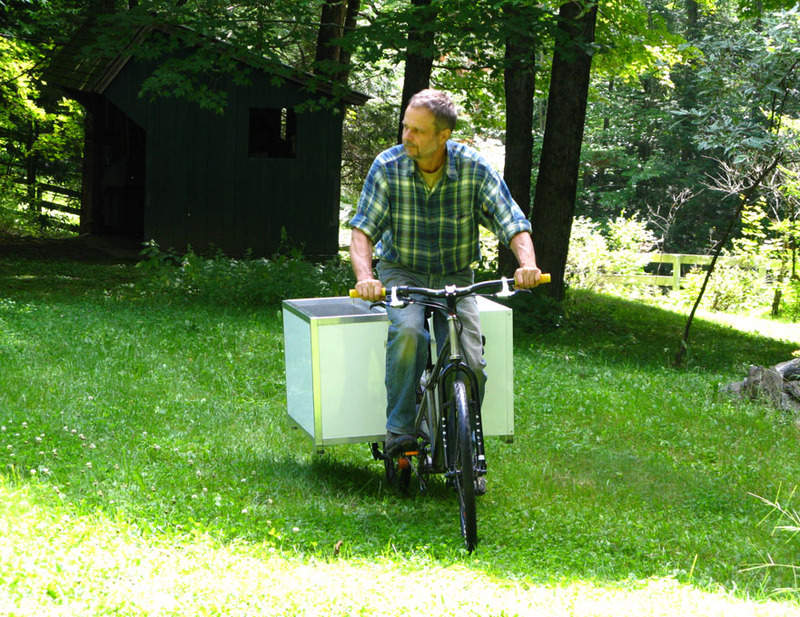 We offer electric bike kits and have since 2008.